Atherstone in Warwickshire was once an important hatting town, and became well known for its felt hats. The industry began in the 17th century and at its height there were seven firms employing 3,000 people. Due to cheap imports and a decline in the wearing of hats, the trade had largely died out by the 1970s with just three companies remaining, Denham & Hargrave Ltd, Vero & Everitt Ltd and Wilson & Stafford Ltd. The production of felt hats in the town ceased altogether with the closure of the Wilson & Stafford factory in 1999. The Feltmakers Charitable foundation makes a contribution towards hatters’ pensions in Atherstone, Stockport and Luton each Christmas. Pensioner hatters join the Master at the St. Clement’s day lunch on 23 November 2016. 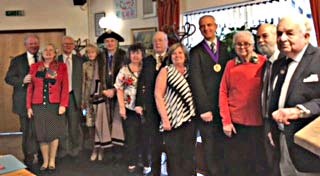 The St Clement’s day lunch was started by Past master Geoffrey Vero some ten years ago and is attended by 90 to 100 pensioners and the Mayor and Councillor of Atherstone. The Luton Lunch for pensioner hatters in Luton is held in February. Saint Clement’s Day was traditionally, and in some places still is, celebrated on the 23 November, a welcome festival between Halloween and Christmas. Pope Clement I is the patron saint of metalworkers and blacksmiths, and so these workers traditionally enjoyed a holiday on his feast day. Originally considered the saint of metalwork and blacksmiths, St Clement is also considered the patron saint of millinery, and is attributed with discovering felt. St Clement the monk is said to have lined his sandals with wool before starting off on his pilgrimage, and the friction turned the lining into a type of felt, similar to that which we use to make our hats today!